Planning and executing a weight loss challenge can be daunting, but the payout can be HUGE if you do it right. So, how do we execute our yearly 6 week weight loss challenge that typically brings in $15k – $20k in extra revenue? Participants register in advance for a variety of different program options based on their needs. For example, some people just want the friendly competition and that is enough to motivate them to do what they need to do so they pay only $47 to enroll. Others want more private instruction and will enroll in the program that includes personal training two times per week for $997. top 5 revenue generating secrets. Participants sign up to various trainer’s teams. Each trainer is responsible for recruiting team members up to a maximum of 15 people per team. Teams compete against each other and trainers get bragging rights if their teams win. We schedule a launch date. This year our program launched on Wednesday April 19th. At this meeting, we do a review of the program expectations including workouts and nutrition and then each team meets with their trainer. Our programs are typically 6 weeks long. We do baseline measurements the first week, weekly weigh-ins are completed and then final measurements are done. Team progress is reported weekly so teams can see how they are doing. Each participant receives a gift. Past years we have given t-shirts or gym-bags. Each participant also receives our ‘Fitness Results Manual’. This is the resource that we use to guide each participant throughout the program. It has all the information they need to ensure success and document their progress including logs. We sell the license to utilize this manual for all your programs. It will be the most valuable resource you use in your business and will save you tons of time and money that you would otherwise spend trying to create your own. 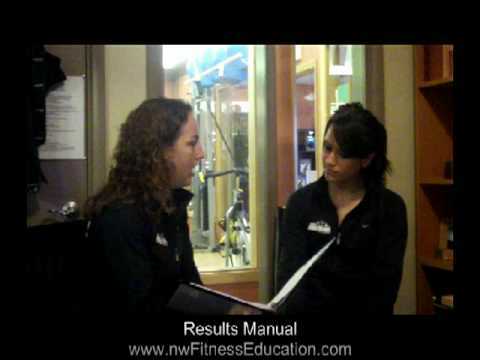 You can email kari@nwpersonaltraining.com and she can provide you with more details or go HERE for more details. We promote this program on our website, in our enewsletters and on Facebook. We also post fliers at our studio and throughout our community. Each program attracts approximately 200 participants so it’s well worth your time. In addition, many non-clients participate in the program, get introduced to our studio and how cool our trainers are and then become regular clients so it’s a fabulous marketing initiative also! We sell this resource to fitness professionals like you to use in your own business. Change our name to your name and our logo to your logo and run with it! During the month of April you will get an automatic %25 off ($124 savings) the Fitness Results Manual! Now you have the information you need to run a super successful makeover challenge and the resource tool you need can be yours too! Don’t hesitate. Like what you see here? Want more info, more details and more forms for your business? The Business of Personal Training System is for you! I give you the exact system that I use everyday at our small 5,000 sq. foot Personal Training studio. Did you know that I wrote the ONLY complete training business system designed to help you run a million dollar personal training business?! You can have this same business system that will help you work SMARTER and generate HUGE profits like we do here at Northwest Personal Training. The fee to purchase the Business of Personal Training System can be made up within 1 month of increased PT sales and there are NO recurring franchise or licensing fees. A comparable business system in other industries would require an initial investment of tens of thousands of dollars. Buy now and catapult your PT business to a new level.